The analysis shows that we are expecting a 40-day cycle trough to form, with the nest-of-lows for that trough centered in next week. However there has been scant evidence of the shorter cycle troughs forming since the mid-October trough, and so that nest-of-lows is very much an estimate. 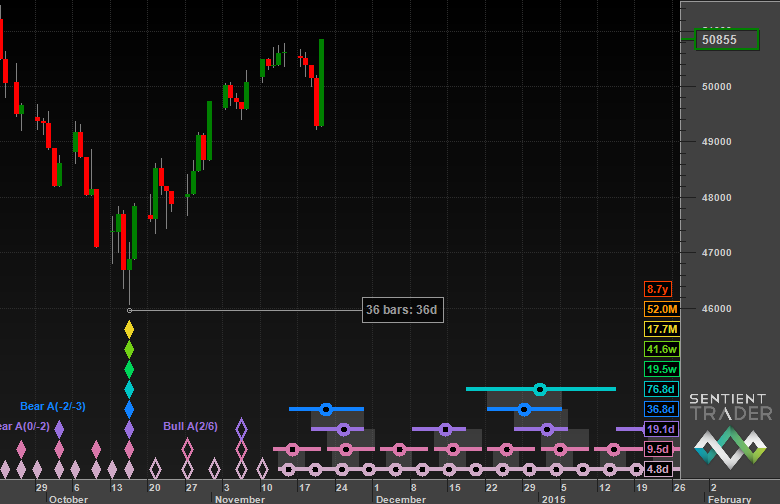 And it is important to remember that when the underlying trend is bullish (as it is) we expect troughs to form early. Is it possible that the 40-day cycle trough has already formed? A very clear trough formed here, right above the nest-of-lows for the 40-day cycle trough. I don’t expect all markets to form the same troughs at the same time, but Hurst’s Principle of Commonality leads us to expect troughs to form at similar times. 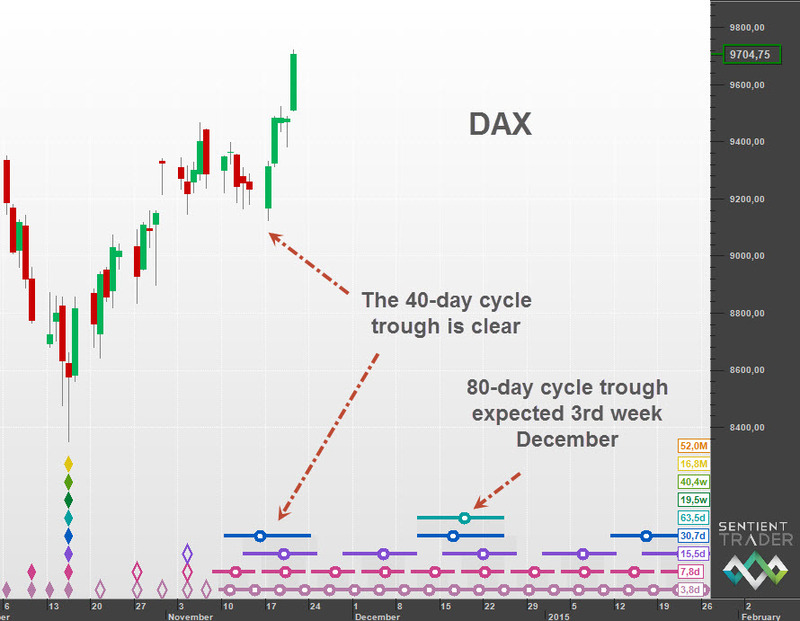 The analysis of the DAX implies that the 40-day cycle trough has already occurred. 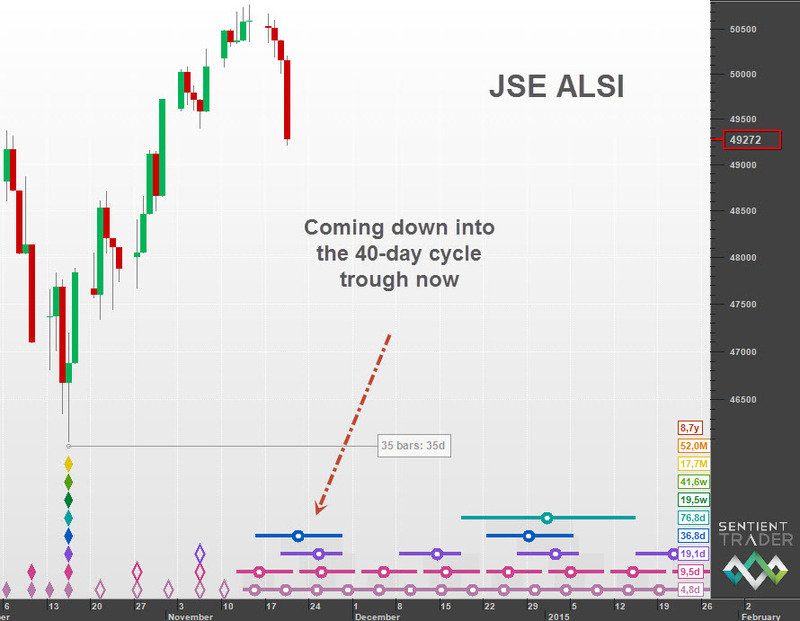 The JSE is clearly still in the process of forming a trough, but my experience with the South African market is that the shorter cycle troughs are often displaced by several days, whereas the European and US markets tend to be more in sync with one another. 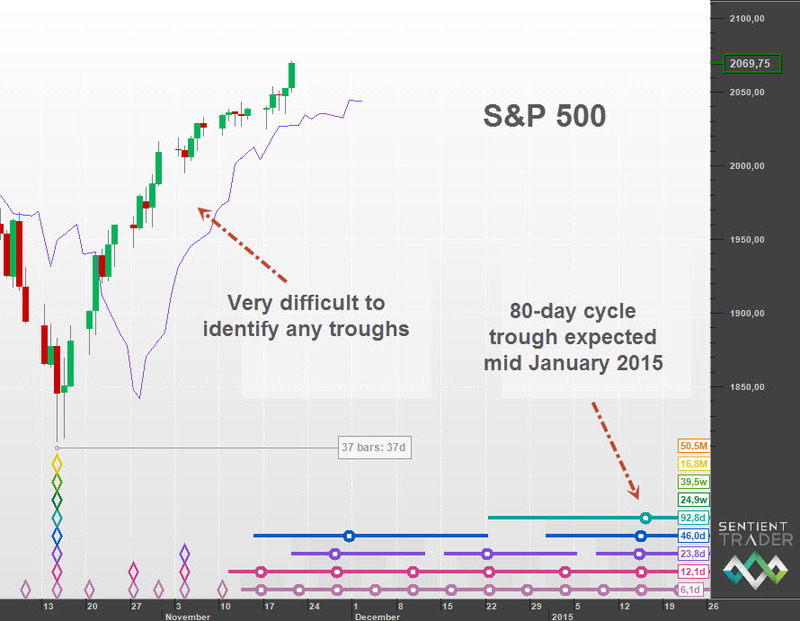 I find it very interesting to watch the cycles unfolding in markets around the world. Often questions in one market can be answered from another market on the other side of the world. UPDATE: Here is an updated view of the JSE All Share Index, which includes Friday’s move. Looks like the 40-day cycle trough has come in! As a matter of interest the way in which the South African market suddenly played “catch-up” is something that I have often profited from. Trading an emerging market can be frustrating as one deals with the greater volatility, and sometimes inexplicable contrary movement (relative to the US and European markets). But when the market “catches up” with the bigger markets is often does so with a vengeance. Hi Huub. We expect troughs to form early relative to the average wavelength of that cycle (sometimes referred to as the nominal length), because of the time translation effect of the longer cycles. And so I expected the 40-day cycle trough to occur earlier than the average 34.1 days. From a theoretical perspective timing should be more accurate if early and late is relative to peaks and troughs in the FLD. For a neutral trend, the troughs coincide with peaks in the FLD. Thus, in an uptrend the through can never be later than the next peak in the FLD, while in a downtrend the trough can never be earlier than the previous peak in the FLD. Then the FLD provides a robust experimental constrained, a demarcation with respect to timing that is largely unbiased. That’s an interesting approach to time translation, thank you for suggesting it Huub. That is an interesting point. I’m going to watch for it. From a theoretical viewpoint the FLD delivers basically four events to help improving the accuracy of timing in the data. The trough, the up crossing, the top and the down crossing. 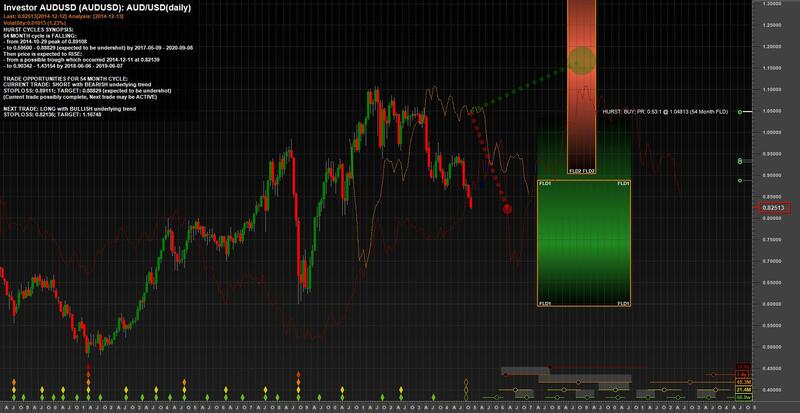 Today I came across this analysis for AUDUSD on the 18Y cycle, which I think is neat. Starting in 2001, with the trough there is the up crossing in sep 2004 where the MCP is also a trough of the 54mo, then the bottom in the FLD is marked by the 9y trough, while the uptrend is clear as the overall peak in Oct 2011 is right shifted relative to the FLD bottom. Then the down crossing coincides with an MCP formed early 2014 or being formed around now with a 54 mo trough. The starting point of the analysis is 1981-1-17.